The Waco F series is a series of American-built general aviation and military biplane trainers of the 1930s from the Waco Aircraft Company. The initial models were the INF (125 hp (93 kW) Kinner engine), KNF (100 hp (75 kW) Kinner) and the RNF (110 hp (82 kW) Warner Scarab), all of which had externally braced tailwheel undercarriages. Many further sub-models followed with more powerful engines of up to 225 hp (168 kW). The most powerful in the range was the ZPF of 1936/37, intended for executive use. 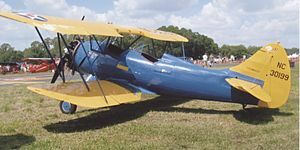 The 1934 model YMF was substantially redesigned with a longer and wider fuselage, larger rudder and other structural changes, and put into production in March 1986 by WACO Classic Aircraft of Lansing, Michigan as the YMF-5. Over 150 YMF-5s were completed as of 2017 with new examples being built to specific orders. 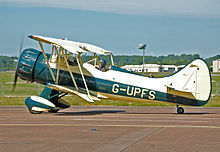 Considerable numbers of 'F' series biplanes, both original and newly built, remain in service. 125 hp (93 kW) Kinner B-5, Certified ATC#345 on 2 August 1930. 100 hp (75 kW) Kinner K-5, Certified ATC#313 on 12 April 1930. 110 hp (82 kW) Warner Scarab, Certified ATC#311 on 7 April 1930. Note: from 1936 Waco added year suffixes to designations—e.g. YPF-6, YPF-7, with the numeral being the last digit of the model year. Guatemalan Air Force - At least 1 Waco YMF-7 received in 1934. Was still in airworthy condition in 1998. United States Army Air Corps - Adopted the UPF-7 as the PT-14, with one XPT-14 and 13 YPT-14s being purchased, with an additional UPF-7 impressed in 1942 as a PT-14A. ^ a b WACO Classic Aircraft (2009). "Own the Dream". Retrieved 2009-06-12. ^ Al Hansen (Spring 2004). "The Waco Model F". AAHS Journal. ^ Grady, Mary (June 2009). "Waco Updates Its Classic Biplane". Retrieved 2009-06-25. ^ "Waco". Aerofiles.com. Retrieved 2012-08-23. ^ Sloot and Hornstra Air International January 1999, pp. 55, 57. ^ Swanborough and Bowers 1963, p. 535. ^ Swanborough and Bowers 1976, p. 474. Simpson, Rod (2001). Airlife's World Aircraft. Airlife Publishing. ISBN 1-84037-115-3. Sloot, Emile; Hornstra, Luc (January 1999). "Fueza Aerea Guatamalteca". Air International. 56 (1): 55–58. Swanborough, F. G.; Bowers, Peter M. (1963). United States Military Aircraft since 1909. London: Putnam. Swanborough, Gordon; Bowers, Peter M. (1976). United States Navy Aircraft since 1911 (Second ed.). London: Putnam. ISBN 0-370-10054-9. This page was last edited on 24 November 2018, at 03:55 (UTC).